According to me, Sri Ramakrishna is the greatest scientist in the field of spirituality. One may call him a sage or a mystic of modern age, a Man of God, God- incarnate, etc. according to one's liking and everyone would be correct in his/her own way of understanding him. This is because he encompasses every aspect of religion and mysticism in his life and teachings. Every soul can take something from this perennial fountain of spirituality and nourish his/her heart with purity, holiness, and selflessness. Sri Ramakrishna was the most 'rational mystic'. With scientific precision he put forward in most simple terms, as parables and stories, the eternal truth regarding God and God realization. Like a scientist in the field of other physical sciences, he talked about God only after directly experiencing the reality of God. He did not theorize or put forward philosophical conjectures to claim the divinity of each soul, but actually realized this truth that the true nature of man is Divine Consciousness. This intuitive knowledge was based on his experiences during various spiritual practices he undertook in his young age. These practices included all traditional Hindu disciplines, and also sadhana of Muslim and Christian faith. During these spiritual practices, he got established in the highest non-dual consciousness and realized the same truth about the Reality, i.e. there is only one and only one Reality (or Truth) which is called as Brahman or God in Vedanta. His flights in the divine states of altered consciousness would have been beyond description had Sri Ramakrishna himself not told his experiences to his disciples. These included one Mr. "M" who chronicled his life, sayings, and experiences during the period 1882 to 1886 as TheGospel of Sri Ramakrishna. The other one, the great Swami Vivekananda made the Vedantic teachings of Sri Ramakrishna broadcast to the both the East and the West. The Holy Ganges has carried spiritual aspirations of millions of Hindus to the 'Ocean of Bliss'. She has nourished and nurtured many Divine souls of past ages down to Sri Ramakrishna of the present age; and ferried thousands of scorched souls across the 'Ocean of Worldliness'. 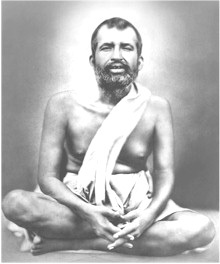 Sri Ramakrishna was the epitome of spirituality. Humanity has not yet recognized the true import of the descent of this rare soul on the earth. It has become more humane and spiritual on 18th February 1836 with the advent of this noble soul on this earth. His special mission, as God incarnate, in today's world of strife and strike, terrorism and fanaticism, poverty and hunger, greed and corruption, will be recognized in due course of time. Sri Krishna, Lord Buddha, Jesus Christ also went largely unrecognized during their life-time, but a wave of spirituality was generated decades and centuries after them to lift the masses from ignorance and dreariness of mundane existence to the light of divinity. The same phenomenon - much stronger and nobler - is being witnessed today as an aftermath of spiritual power unleashed by Sri Ramakrishna, Swami Vivekananda, and The Holy Mother. The fortunate ones will drink the nectar from this source of eternal bliss and will feel nourished forever. The ignorant will be washed clean of their mental dirt to get attracted to this powerful magnet in times to come. This time, nobody will be left untouched. This powerful current of Divinity will effect certain degree of change in every mind. The alert will grab the opportunity to go beyond greed, corruption, perversions, sense enjoyment, and egotism.